The nilgai (Boselaphus tragocamelus) is the largest Asian antelope species and is indigenous to the Indian subcontinent. 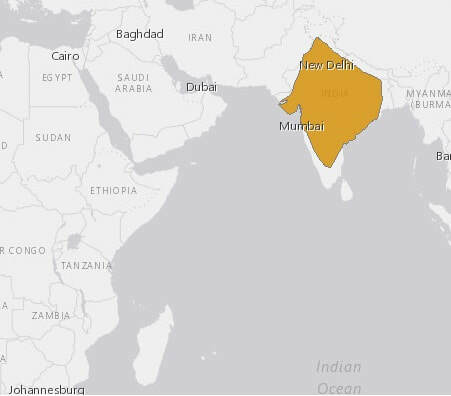 Most of their population is found in northwest India on lowlands located in the foothills of the Himalayas, but their range extends southward into central India. The species is much more uncommon in Nepal and Pakistan and is now considered extinct in Bangladesh. However, the nilgai was also introduced in Texas in the 1920's, and today thousands can be found in the borderlands between Texas and Mexico. From the 4 Indian antelopes species, the nilgai is the only one still commonly found today, probably to the cattle like sacred status given to them by Hindus. The nilgai is also known by other names such as bluebuck, white-footed antelope, neelghae, nilgo, nilgau, nylghau, blue bull or blue horse. With their quite unique appearance, the nilgai is very different from the African antelopes. Considered the largest of all Indian antelope species, an adult nilgai bull reaches a length of up to 210 cm standing at 130 to 150 cm at the shoulder, weighing up to 288 kg. There's an evident sexual dimorphism, since females are lighter and smaller, weighing between 100 and 213 kg (220–470 lb). Females, calves, and juveniles are orange, tawny or pale brown in color. While adult males have a bluish-grey coat and black legs, that's why many of the species common names refer their bluish coloration. The nilgai has a sturdy body with a sloping back, deep neck with a somewhat small head with white facial spots. Both males and females possess a mane on the top of the neck, a tuft of longer and coarse hair just below the white patch found on the throat. Only males display sharp and bi-curved, blackish colored horns, but these are rather short, measuring between 18 and 24 cm. While their tail is relatively long, reaching a length between 45 and 54 cm. They have a usually thin, wiry hairy and also somewhat oily. While their skin is thick, especially that found on the neck and chest of males, forming a kind of dermal shield. Since the nilgai antelope requires only minimal cover it preferably inhabits areas with scattered trees and short bushes. It's commonly found in areas such as dry savanna, grasslands, thin woodlands, plains and low hills covered with shrubs. They normally avoid dense forest habitats and deserts but can be found in agricultural lands where they sometimes severely damage human crops. For that reason, the nilgai is now considered a pest in several Indian states. In the south Texas and Mexico border, they also found a well-suited habitat to their natural preferences. ​​These antelopes are diurnal but are most active during early morning hours and the late afternoon. Nilgai eyesight and hearing are considered good, unlike their sense of smell. The Nilgai is considered a moderately gregarious species, usually found in herds of about individuals, but exceptionally they will form larger herds of 20 or more animals. Normally the nilgai is a silent animal, but when alarmed they will make roaring like vocalizations. The nilgai often falls prey to tigers, but they can reach speeds up to 29 mph when chased. There are no subspecies recognized by scientists. The nilgai common name derives form from the fusion of 2 Hindi words, nil meaning "blue" and gai which translates to "cow". The species was first described by the German zoologist Peter Simon Pallas in 1766, the nilgai is the only member of the genus Boselaphus. In their original habitat in India, the nilgai feeds mostly on grass, however sometimes they will also eat seeds, desert succulents, leaves, flowers, fruits, and even stem tops. The Nilgai is capable of reaching the higher branches of trees by standing on their hind legs. But the nilgai was introduced into a private ranch in Texas back in the 1920's for sports hunting. Since then some specimens have escaped and formed a small but strong wild population. These introduced animals feed mostly on mesquite, partridge peas, oak, nightshade, croton, and several other kinds of grass. While in India they are considered browsers or mixed feeders in Texas the nilgai is regarded primarily as a grazer.The nilgai will even cross marshlands to get to their food source. Usually, males and females remain segregated for most of the year. Mating does occur all year round with calves being born almost every month, even so, there are noticeable 3 to 4 month peaks which vary according to geographic location. In India, the nilgai breeding season extends from October to February peaking in December and January in the Sariska reserve and from November and December in the Bharatpur National Park. While the introduced nilgai population found in Texas has their mating peak occurring from December to March. It's still unclear if the nilgai mating system is based on male rank hierarchy or male territoriality. The use of dung middens may suggest a form of territory demarcation, but these are used by all nilgais whether it be adult males or females but even calves use them. During the mating season, males in rut roam around searching for females in oestrus, at this time they become more aggressive and will fight among themselves for the right to breed. In these fights, both males will hold the head upright displaying their enlarged chest, throat patch and beard and engage in neck wrestling. Sometimes males kneel and lunge at each other with their horns and also run toward the other their horns pointed forward. The victorious male then protects the female from other males. Courtship normally lasts about 45 minutes. Females will isolate themselves before giving birth. After a gestation period of 8 or 9 months, calves are born, usually 1 or 2 but it's not uncommon to see triplets being born. Even though the herd composition is quite variable the mother and calves association is a lasting one and females may be followed by calves of different ages. The calves are capable of standing upright within 40 minutes of birth, they weigh about 7 kg at birth. Like other bovid species, they are kept hidden for the first 4 weeks of their lives. At about a month of age, the calves begin to accompany their mothers and start to forage. Females breed again soon after giving birth, usually within a year. Females reach sexual maturity at two years of age usually giving birth for the first at 3 years. Males become mature around 4 or 5 years of age, and normally leave their mothers at about 10 months to join bachelor groups. ​The nilgai is listed as a Least Concern species in the IUCN Red List. Even though they aren't listed by CITES or USFWS the nilgai like many other animals is threatened by habitat loss and poaching. These antelopes are hunted for their meat, even though the Nilgai isn't commonly consumed by Hindus due to their religious significance, the species name in Hindi means literally "blue cow". Their population in India is estimated to exceed 100,000 individuals, with the species covering a large portion of the Indian subcontinent. It remains common in Indian lowlands, with the species occurring in numerous National Parks and other Protected Areas in India. But habitat destruction and over­hunting has taken its toll in Nepal and Pakistan where it has become rare and Bangladesh where it's now considered extinct. The species has also been introduced to the USA and Mexico, and today more than 60,000 have established on Texas ranches and around the Texas-Mexico border. Their preference for agricultural crops means that they are considered an agricultural pest in some parts of India, and subject to poaching. These antelopes are hunted for their meat, even though the Nilgai isn't commonly consumed by Hindus due to their religious significance, the species name in Hindi translates literally has "blue cow". The Alexandrine parakeet gets its name from Alexander the Great who exported them back to Europe.